Here is another winner in our routine–Kefir. It’s similar to yogurt in flavor, with a little bit different zest to it. Kathy and I drink it plain for breakfast, and it is also very good with frozen blueberries. It makes an excellent complement to soups, especially borscht. We use kefir grains as our starter culture, which we originally received from a friend. We’ve kept this particular set of grains alive and going for more than 2 years now, and we’re very happy with them. There are other cultures out there that do not use grains, but they cannot be propagated between batches, and you need to purchase more as you use up your culture packages. The basic recipe uses about a quarter cup of kefir grains to a quart of milk. Cover the jar, and put it in the cupboard (or another dark place) at room temperature for a day. When it is finished, the milk will have thickened but not curdled. Filter the grains out of the cultured milk (kefir) with a strainer before drinking it. Put the jar of kefir into the refrigerator, and add the grains into your next batch of milk to repeat the process. Sometimes we rinse the grains under cold water before adding them to the next batch of milk, but that isn’t a necessary step. We are fortunate enough to have goats, and when the warm milk comes into the house, it is immediately added to the kefir grains. The freshly strained kefir is very good! The grains are a complex combination of bacteria and yeast, and vary in size from tiny rice sized bits to large inch-wide chinks. They are translucent white, and quite firm–almost rubbery. They increase by about a third with every batch, so after a while you may have more than you need. In our house, that means we offer them up to the kids, who come running to eat them. The grains taste like kefir (surprise! ), and just have a different texture. Like the kefir itself, the grains are also an excellent pro-biotic. 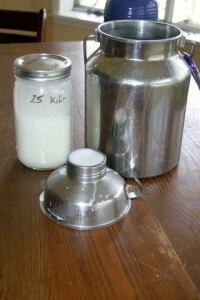 Fresh goat's milk is immediately added to the kefir grains. More grains will make the milk curdle faster, as will warmer weather. This will happen to you sometime, but don’t despair. 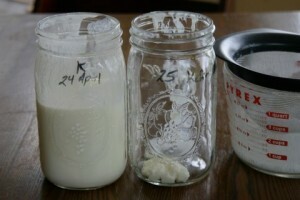 Filter out the curds for kefir cheese, and keep the whey in the refrigerator–it’s a useful ingredient in many recipes. If you don’t need them working every day, the grains can be kept happy for several weeks by putting them in some cold milk in the refrigerator. The cold slows them down, and the milk keeps them fed. It originated in the middle east, and I first heard of it from another student in a cheese-making class as “too good for infidels”. I agree with that description now, but I’d rather call it the “champagne of milk”. This entry was posted in Food & good eating and tagged kefir, kefir grains, probiotic. Bookmark the permalink.